The only all-suite hotel inside the Disney Springs™ Resort Area, the DoubleTree Suites by Hilton Hotel Orlando - Lake Buena Vista, in the Walt Disney World® Resort offers a fantastic location for anyone. Experience first-class service and be provided all the comforts of home in the shape of one or two bedroom suites which offer a wide range of amenities. 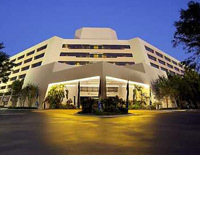 Additionally the hotel offers complimentary transportation to most Walt Disney World attractions. A 229-suite hotel, each one-bedroom suite features microwave, refrigerator, coffee maker, in-room safe, pullout sofa and at least 2 televisions; rooms for smokers available. Specialized kids attractions, which include a splash pool, playground, Kids' Theatre, game room and video arcade.